In a search about StitchFix (see my review here) I found great reviews about ThredUp. Basically it is an online consignment store. It is a way to buy and sell your gently used clothes. I'm a big fan of consignment and thrift stores but don't have the time these days to sort through racks of clothes. When the site sent me a 40% off coupon, I decided to try it out. 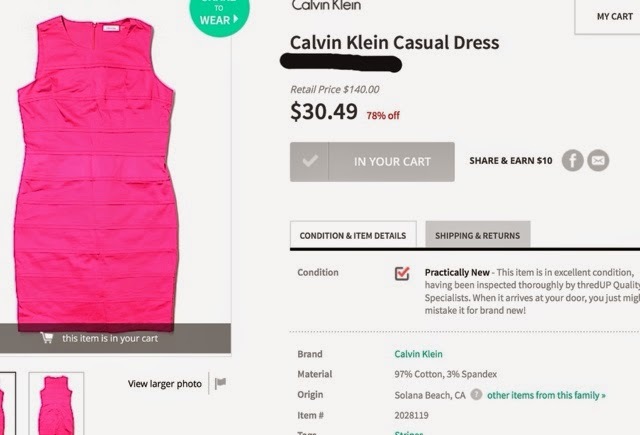 I'm needing some more formal dresses for events this spring and summer so I decided on this CK dress. The condition calls it practically new so I was curious to see how new that is. I'm betting some of the more formal dresses on the site have only been worn once. My thought is this could be a perfect source for dresses to wear to weddings without breaking the budget or making me feel like a heavy consumer. With my 40% off coupon this dress was $22.65 including tax and shipping. Probably pretty close to what I would pay in a consignment store, but way less energy of mine expended to make the purchase. As long as the dress is truly practically new, it will be a good deal. As a note, I've started really noticing the difference in brands and quality in my closet. My interest in StitchFix has included wanting high quality items. Things I buy from the discount wear house just don't last very long. The brand names I buy, have great lasting power. No pilling, no threads coming out and no fading of colors. As I'm noticing it more, it pushes me to look for better quality timeless options in place of disposable clothes from the discounters. So I made the order online over the weekend and it was at my door on Wednesday. They are based in San Fran which helps but that is speedy shipping. The packaging is cute too. The dress was wrapped in tissue paper even. And, I'm very pleased with the condition of the dress. Practically new was an accurate description. No wear marks on it at all. The color is very vibrant and I'm looking forward to wearing it. I found this program while searching about Stitch Fix. Other bloggers suggested it as a more budget friendly version. But that is comparing apples and oranges. I think this is more like an online consignment shop. It is very convenient and gets you access to great items at affordable prices. But there is no stylist involved. It is a cheaper way to buy clothing than Stitch Fix, but they are very different services. And I like them both. 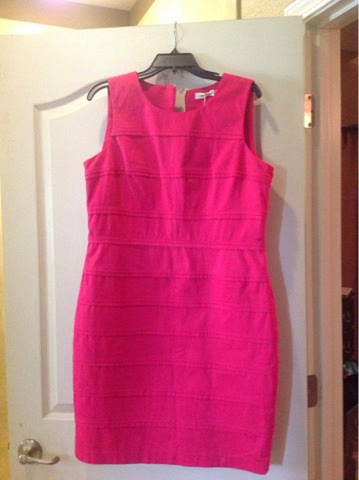 ThredUp may be a great source for special occasion dresses for me in the future. After the dress arrived and I was pleased with the experience, I decided to order a bag to sell them some clothes. They want higher end brands - which I don't have many of - but they take adult and childrens clothes. I'm thinking I will try it out and let you know what I think. Have you tried it? What did you think? Or is there a similar service I should check out as well?